Most companies know that team building activities are beneficial. But how? When faced with challenges, team members must exercise several skills like: situation analysis, brainstorming, problem solving and leadership. We, at Vetro, have taken this formula for successful team building and created memorable, unique and challenging opportunities that will allow your team members to achieve a common vision, break through communication barriers, exercise flexibility in decision-making, project direction, and learn to trust and depend upon each other. Challenge your team within a setting that removes the boundaries that team members face on a daily basis. New interaction will allow your team members to see their colleagues from a different perspective. Pave the way to overcoming communication problems and breaking down barriers they may not have even realized existed. 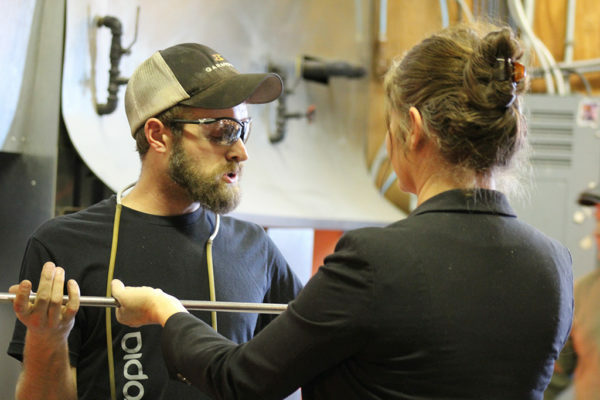 Prior to your Team Building Event, the Glassblowers like to create a hand-blown piece to show the overall process of glassblowing and how our team works together. This allows everyone to see firsthand how a team of Glassblowers at work. Next participants will be paired into teams of two and assist each other while each creating their very own glass pieces. Each attendee will choose from a selection of several colors for their glass artwork. The glassblowers assisting them will get the first gather of glass. The participant will be able to apply their chosen colors and help reheat the artwork. The participant will be able to swirl and twist their colors until they are happy with their design. The participant’s Team member is in charge of reheating the artwork in the furnace. The last gather of glass and final shaping will be done by the glassblower. Finally, in the “Bubble Blowing Contest” your team will choose two of the Team Building participants, we will then give each participant a blowpipe with a gather of molten glass on the end and see who can blow the largest bubble. Team Building packages are offered Tuesday – Saturday 10 a.m. to 6 p.m. Please call the Gallery at 817-251-1668 to check for availability. Vetro will not be able to book or secure your time slot for your event without a $600 deposit or a $1500 deposit for after hour events. Bleacher seating is available for your Team to relax on. During your Team Building Event, you may have your event catered – Vetro does not provide or coordinate catering. You are more than welcome to inquire about caterers that Vetro recommends by calling our Gallery anytime at 817-251-1668. Once your Team Building event styles are chosen we can create the finalized contract. Our Team looks forward to working with your Team. Let’s create something beautiful together! Please make sure to bring your camera and capture your molten glass memories! SEPTEMBER SPECIAL – COMPLIMENTARY GLASS ART BONUS! Vetro’s Teambuilding events create an exciting and engaging holiday experience for your employees! While we know the primary focus will remain being the acknowledgment of your staff and all the amazing work they’ve done, Vetro will also turn the party into an opportunity for networking and team building. 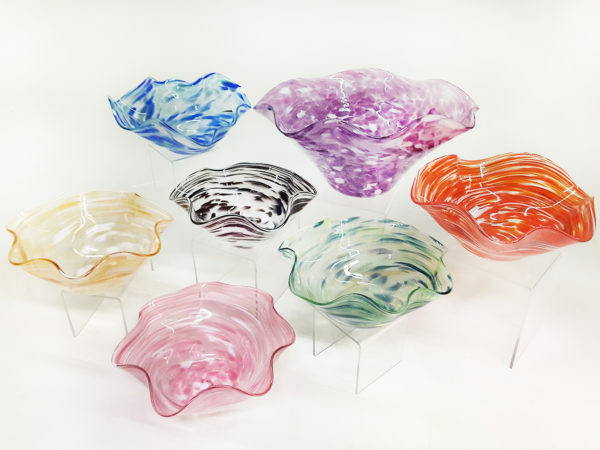 Not only will each of your team members make and take home their own unique glass art piece, now if you book BEFORE October 15, 2018, you will also receive a FREE Vetro art glass bowl! Your team will be able to choose from one of the seven glass bowl color options shown below! This glass art piece will be created by Vetro’s team during your Teambuilding demonstration.